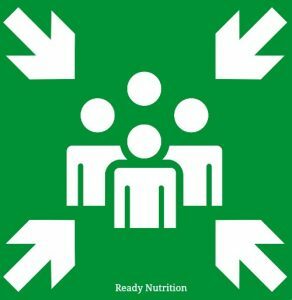 ReadyNutrition Readers, this is going to take some planning on your part, as each person and family’s geographic location and other demographics (number of family members, etc.) are going to determine courses of action. One of the problems that may be faced is that nobody will be home when the SHTF, and there may be a considerable distance for everyone to travel to reach home when that happens. One way to lower your risks in traveling is to plan out and create rally points and hide sites. FEMA also emphasizes the importance of having a family rally point. Everyone is our hypothetical family is working and studying on the West Side of town, and home is to the East of town, for convenience’s sake. Let us also say that the SHTF event is an EMP (Electromagnetic Pulse) attack. The optimal location would be for the rally point to be established nearest to Susie, as she is the closest to home. The others could make their way to this rally point…. let’s say it is a large oak tree in the park…where they would link up with one another and then attempt to reach home together. In addition to this, just in case things become too “hairy” you should establish a hide site. A hide site is nothing more than a place to rest and regroup (possibly with some supplies that are hidden or cached) before continuing your movement home. With everyone firmly rooted in the mentality of English property law, this may require you to establish a hide site that may be located on someone else’s property, such as a business or an abandoned/dilapidated structure. You make the call and be the judge: when the SHTF, you can write a check to the property owner if you feel the need for sleeping in the abandoned barn with only three walls and half a roof. Mr. and Mrs. Anderson and family can take all the guesswork out of worrying for one another by having a premade plan that has been practiced. A good deal of security and sense of confidence will come just from having a basic plan that each family member knows, and each family member knows that all of the other family members have the plan memorized and are going to carry out their parts. You can aid each other in these plans with Motorola’s in the vehicles, shielded by a Faraday cage. Turn on your agreed-upon preplanned family frequency when it’s safe to do so…and make communication when you’re able. Now, back to a hasty rally point. When you’re traveling toward the house? A hasty rally point is a point that is identified by the group leader of your family as a fallback location while in the middle of movement/ traveling. The hand-and-arm signal for “Rally” in the United States Army is to extend your right hand straight up, palm flattened, and make a circular motion above your head, fingers extended and joined. Make sure all of your family members see it. Then point to the exact location you have in mind: a small hollow at the base of a hill, a large boulder next to a creek, or whatever is decided upon. Make sure each family member sees both the sign for “Rally” and you pointing to exactly where it is. If trouble arises and everyone has to run, you will meet up at this rally point and then determine if you will proceed as you were going, or what alternate route you’ll take. Planning is everything in this, and rehearsals will make it as perfect as it can be. Help one another and take time to consider the best locations you can use, and give yourself a better chance. Anything that will tip the scale in your favor even a few percentage points is worth your consideration. Fight that good fight, every day. JJ out!